From a Czech band named Dunaj (Danube in Czech) to Annea Lockwood’s 2005 Sound Map of the Danube, it seems the Donau (in German) is an inspiring river for musicians. Still, Johann Strauss’s 1866 Blue Danube (An der schönen blauen Donau op. 314) is hardly able to inspire anything but depression. 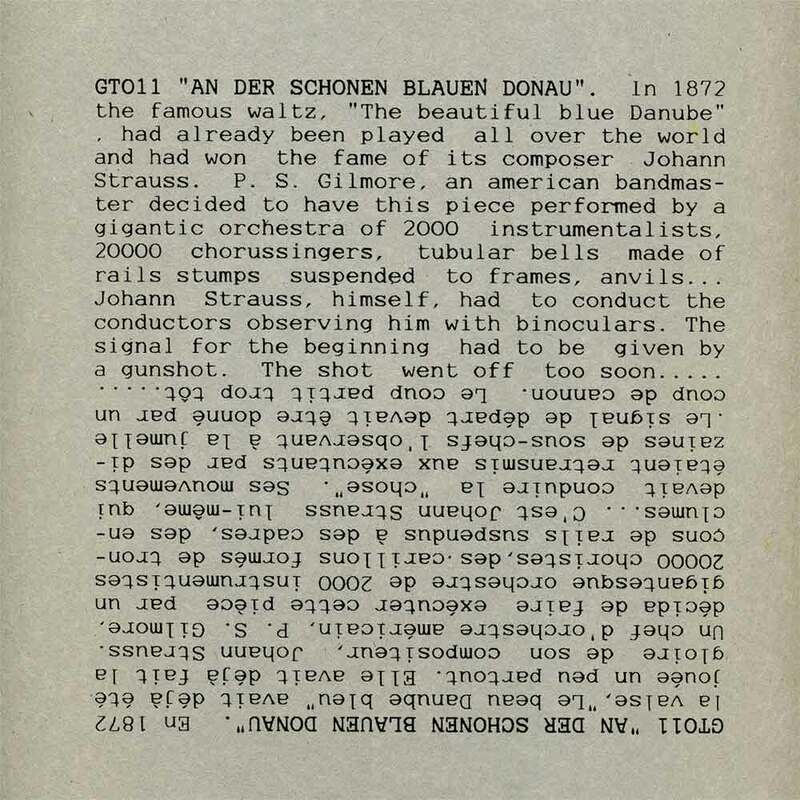 Therefore this legendary ‘An Der Schönen Blauen Donau’ compilation LP was something of a provocative gesture from Belgium’s Home Produkt founder Patrick Stas. He commissioned new versions of the famous waltz to various avant-rock and radical mavericks from Europe, Australia, Japan and the US. The result, inspired of course by the landmark Miniatures 1980 compilation (and look who’s there track #19: Morgan Fisher himself – note he couldn’t make it to the one minute mark), is an exhilarating mix of poetic, grotesque, mysterious but mostly parodical cover versions. 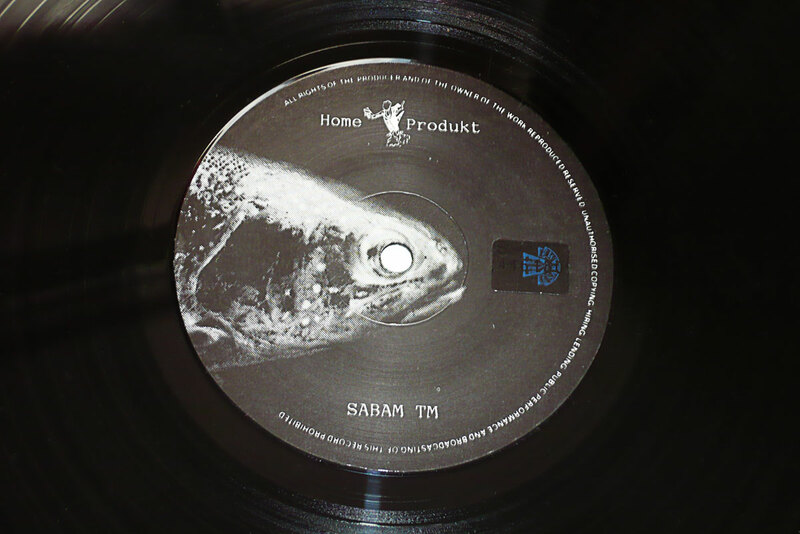 From 1982 to 1990, Home Produkt published underground acts like Jean Claude Charlier et Son Orchestre, Général Thi et Les Fourmis, Tara Cross or LOSP (aka Klimperei), and most are featured here, as well as people from the AYAA and ADN labels. A good point was to invite experimental composers to join in, like Lieutenant Caramel, F.A.R. or Monty Cantsin. The latter take advantage of the end of side 1 to display a gorgeous locked groove that could go on for ever – I let it go for 30 secs in the mp3. An utopian project, this LP is a gathering of tribes from areas as diverse as post-industrial music, post-RIO bands or independent, un-classifiable artists. The myriads of self-releases and independent labels at the time (mid-1980s) allowed such wide-ranging projects – though, as it were, they remained few. 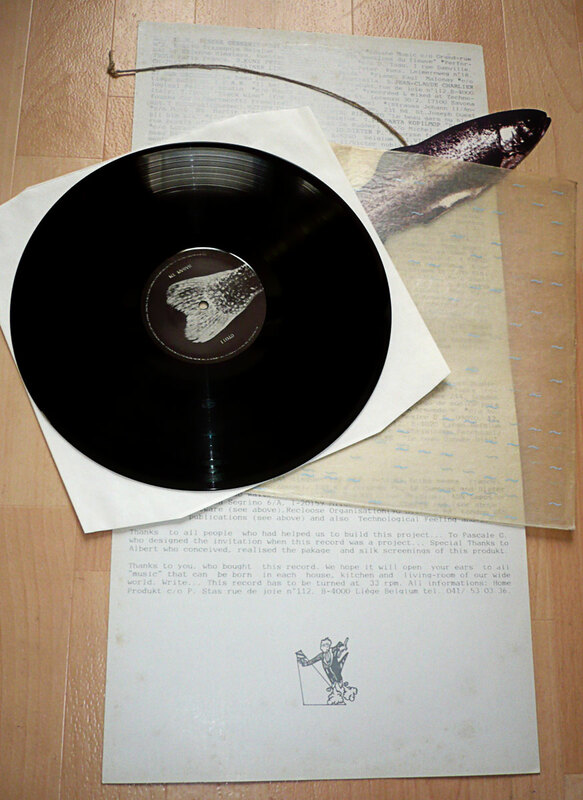 A touchstone of an LP. Salute – and thanks for your wonderful work here! Vinyl-rip and scans and photos and research and all, VERY appreciated. Merci, continuo. I do like waltzes – as long as they are not conventional. Great to see that record here. Thank you both for commenting. You’ll certainly enjoy this exhilarating record as much as I do. Well, if you all love waltzes, here’s one that have been send to me today. It’s the Portsmouth Sinfonia Orchestra‘s Blue Danube Waltz op.314. It’s 4:30 of hilarious amateur music. Thanks to the reader who send me this great track. Oh yes, it’s from the classic “The Portsmouth Sinfonia Plays the Popular Classics” (1974) – the line-up is priceless, and the music jumps for joy. @ continuo: Thanks for the Portsmouth Sinfonia. Actually I have all their releases, but only as Mp3s. It’s a pity that their albums were never rereleased. Thanks. I believe I may have heard a cut from this on WFMU years ago–it was somebody singing the tune while brushing their teeth? I will find out soon enough, but if this compilation does not include that version, you may find it of interest that a recording exists somewhere of somebody singing “The Blue Danube” while brushing their teeth. Sure enough, Bénédicte G. (aka Nadine Bal) of Belgian duo Bene Gesserit is brushing her teeth on the openning track of this LP. Very funny. The WFMU blog also offered a few mp3s from this album a while ago. Thanks for dropping by. vespucci – i completely disagree with you: i don’t know anybody who would be more perfect for a comelade-overdose than you!! but 4 hours is really heavy… maybe you can sprinkle it with some of the originals comelade always used to cover. @Lucky: You’re psychic, indeed. ;-) How did you know? Playing the original rockers vs. Comelade’s versions is part of my plan. Especially stuff like Deep Purple to annoy the owners of that record store which rather sells obscure avantgarde records. vespucci – i’m psychic, alright – but in an akbar/jeff-way, of course! I really was estonished and happy to see that produkt here. The presentation (photo’s and all) is nice. Each artist on this record has perheaps something to say about the download.